Whether they hurt or heal, encourage or embitter, bless or badger, our words matter! 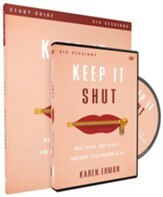 In this devotional follow-up to her best-selling Keep It Shut, Ehman offers 40 days' worth of Scripture, takeaways, activities, and prayers that will challenge you to speak in a way that's pleasing to God and a gift to those who are listening. Zip It empowers readers to put into action the advice and commands of Scripture concerning the tongue. 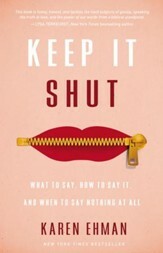 The New York Times bestselling book Keep It Shut covered many topics, including anger, truth-telling, people-pleasing, our digital tongues online, and gossip. Because there are more than 3,500 verses in the Bible that relate to our words and our silence, Keep It Shut only scratched the surface of these issues. Karen Ehman now takes a deeper look and offers practical how-tos that will inspire you use your words to build, to bless, to encourage, and to praise. Each of the forty interactive entries includes a Scripture verse focus for the day, a story or teaching point, and reflection questions with space for readers to write their answers and thoughts. Each entry ends with both a challenge that will help you carry out the directive in the verse and a prayer prompt. Rather than a traditional devotional,the entries in Zip It build upon each other, equipping you with new habits in how to, or not to, use words. Our words are a powerful weapon---for good or for evil. To wield our weapons properly, we need to allow God to steer our speech, aligning our words with his will. Karen Ehman has given us an important tool in this quest. 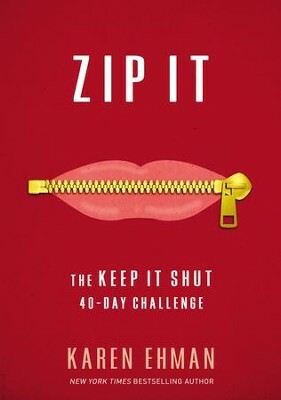 Zip It takes us on a 40-day devotional journey through the Bible, giving us biblical direction, questions for reflection, and a daily challenge to ponder as we discover what to say, Gods way of saying it, and when wed better just shut our mouths. This 40-day challenge is just what I need to help me refocus and think through the words I say daily. Karen Ehmans biblical wisdom, mixed with practical insight and everyday applications, helps me see that I can do better. If I follow Gods Word and think before I speak, I can learn to zip it and so can you! This is a must-read for all of us. Our words hold the power to make someone feel like a king or a pauper. This book will help you with mouth management so the ones closest to you will feel like royalty. Karen Ehman is a trusted guide who will teach you when to zip it and when to speak up. Our words just may be the single most important key to successful relationships. This book is a gem and it reminds us of that. Its practical, easy-to-read, and just what is needed to enable us to use our words in a way that brings life to those around us. Thank you, Karen, for such a powerful book wives and husbands both can use! 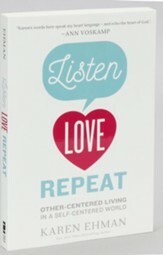 Karen Ehman teaches Gods truth in an authentic, practical, humorous, yet very relational way. In her new book, Zip It, Karen guides us through Scriptures concerning the tongue, while also providing application-oriented takeaways and helpful lessons for our lips. Not only did Zip It inspire me to choose my words more carefully and prayerfully---especially when Facebook makes me feisty---but I also cant wait to read it with my two tween daughters. This devotion will be a go-to for many years to come. Highly recommend! Keeping my mouth shut is a daily struggle---whether its talking too much when I need to listen, partaking in the watercooler gossip when I should walk away, writing my opinion on social media when its not needed, or the hundreds of other reasons. While doing the Keep It Shut study I became more aware of my mouth and its actions. I am so excited for this devotional and the daily reminders of how to keep it shut! I have a feeling I will start it over every 40 days! Thank you, Karen Ehman, for writing this book! Zip It landed in my lap when I absolutely needed to read it. Let me confess, as a woman who speaks far faster than she thinks; this 40-day challenge was a Godsend! With all the different relationships I juggle, Ive witnessed far too many times how my words speak life or death. Im so grateful for the truth and transformation found in these pages . . . and so are those closest to me! Imagine what the world would look like if we only used words to build, bless, encourage, and praise? That is the world Karen offers us through her compelling and life-giving challenge to zip it. This book is a much-needed 40-day diet for the soul---leaving you with new and life changing habits on how to use your words! Karen Ehman combines biblical depth and relational breadth, then wraps it all in practical application, making Zip It the complete package! In it, Karen has identified all the nuances of our speech, especially those with potential to harm, calling us out in the very kindest way, and offering hope for our wayward tongues. The right word in the right manner at the right moment has the power to transform lives. Im so grateful to Karen for inviting us to a place of loveliness and grace with our words in a world that so desperately needs both. 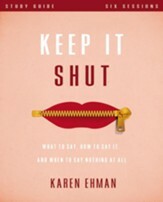 A great follow-up to her book Keep It Shut, this practical and engaging devotional will convict and encourage you! We all need to tame the tongue, dont we? This practical help is exactly what we need to get us there! Karen has done it again! In her coffee-shop-chat style, Karens latest devotional encourages us to use our words wisely. With her perfect blend of teaching and transparency, Karen leads with wisdom and wit. I felt convicted but hopeful that this is a change that is biblical and possible! Few people use words wisely. Those who do are like a rare jewel, as the Scriptures say (Proverbs 20:15). Short, insightful, and aimed at the heart, Karen Ehmans brand new devotional, Zip It, offers hope to those of us who want to be that rare jewel. Powerful! In Zip It, Karen Ehman gives us a hard but needed 40-day challenge to practice using our tongue to heal and give life instead of as a weapon that hurts and kills. Her use of Scripture coupled with personal examples help us learn to use our words for the honor of God and the good of our neighbor. This is a much-needed challenge! Karen equips us with takeaways, lessons, and prayers to ensure the words we speak not only please the Lord but also bless and encourage others. I especially love her challenge to create a word-robe (a word wardrobe) within our hearts and fill it with biblical truths and promises tailored to meet our needs and circumstances. With great application, personal insight, and humor, Karen Ehman dives into an area each one of us struggles with---our words! She has a way of taking touchy subjects, giving them a fresh perspective, and pointing us to grace-covered truth. What a perfect book at any age and stage of life! Our words are directly tied to the condition of our relationship with Jesus. The 40-challenge of Zip It arrives at a great time in the history of the world. Social media, circles of friendships, and family relationships are built and destroyed with the power of our words. 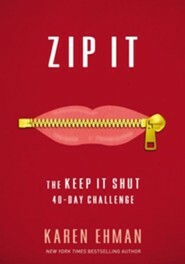 Zip It is a great book that will help you have victory of your mouth! Take the challenge! I'm the author/artist and I want to review Zip It: The Keep It Shut 40-Day Challenge.